Have a superb self catering holiday or short break in Bridge, then Two Bridge Cottage formerly Shadow Dream Cottageis a great choice for you. Self catering accommodation at Two Bridge Cottage formerly Shadow Dream Cottage sleeps 5 with	2 bedrooms	and prices for a weeks stay start from just £310. In a small hamlet, and within walking distance of Forde Abbey and Gardens, this quaint, thatched holiday cottage, one of a pair, has an en-suite master bedroom and a large garden. It makes for lovely accommodation to get away from it all, and is in a great location for exploring this delightful area. Visit many family attractions, explore the famous World Heritage Jurassic Coast or enjoy country walking, golf and quaint village pubs. Shop and pub 2 miles. Living room with elec ‘wood burner’, French doors and wooden floor. Dining room with wooden floor. Kitchen with tiled floor. First floor: Two double bedrooms, each with 5ft bed and TV; one with en-suite shower room and toilet, one with additional single bed (for +1). Bathroom with slipper bath, separate shower cubicle and toilet. 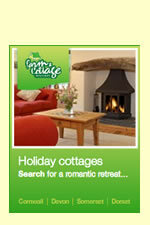 Two Bridge Cottage formerly Shadow Dream Cottage is situated at , Bridgein Devon. A map is below but if you are travelling by car the all important Sat Nav settings are: Latitude 50.84705, Longitude -2.90777 or postcode .